My almost 1 year old. She somehow gets more and more beautiful every time I look at her! She has been the joy in my life since I first found out I was pregnant with her. Such joy I truly did not know existed until I held her in my arms for the first time. Memories like this one are ones to never forget. 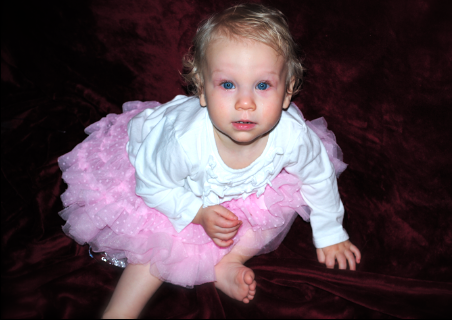 Although Emery does not officially turn 1 until December 14th, 2011 -at 6:54pm PST-, we had a little celebration in her honor this past Saturday, December 10th. (Grandpa's birthday!) We are so grateful for those who were able to come and celebrate with us. Both sides of our family (with exception of one of T's brother's) live long distance and were unable to come. We felt so much love as some of our military friends family joined us that day. What is a celebration without some yummy treats to enjoy? Exactly. It isn't one. So we were sure to share some of our favorite foods. With 7 layer dip, taco meat, and chips to go with it, you can't go wrong there! I was sure to make everything pink in honor of my little girly-girl. Delicious chocolate and yellow cake cupcakes with vanilla frosting, peanut butter zebra pink cookies, and homemade Lofthouse Sugar Cookies. Mmmm. Now I'm all hungry. With some pink decorations it definitely put us in the party mood. Some of my favorite photos of the special girl. She sure had a lot of fun! She was so smiley and happy seeing everyone enjoy themselves. She just loves people! 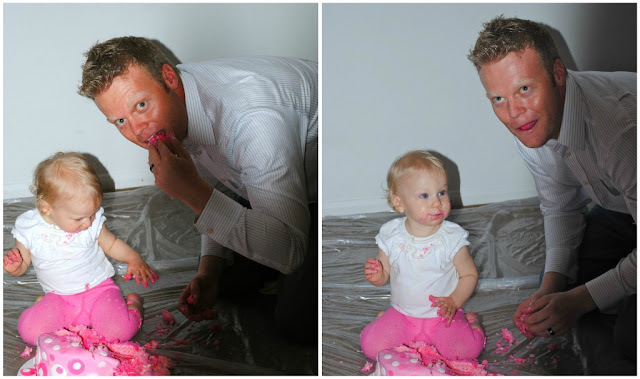 In my family we have been doing a Chinese tradition since my first niece turned 1. This Chinese tradition (in my own words) is that on the child's first birthday, you place in a row a few different items of choice (each item representing something that the child could grow up to be). The child is then placed a few feet away from the items and they are to crawl/walk towards one item. Do this 3 times. It's just really fun! So we did this with Emery and I have the first two times but was unable to record the third final round. And her final round, she also went right for the egg! Too funny! We will be sure to do it again on her actual birthday. She loved seeing some of her favorite people! Sadly we didn't get to take pictures with all of her favorite people who joined us that day. I'm still kicking myself for that one! Look at her gorgeous cake! My friend Katie was so helpful and made it for Emery's party. I truly could not have asked for a more perfect cake! 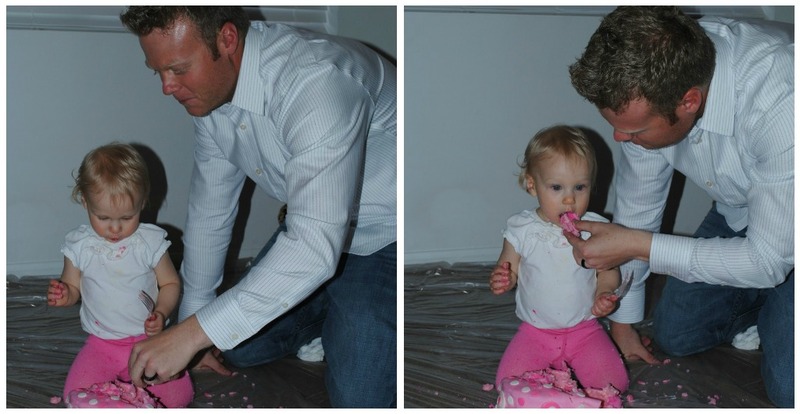 Then came the scary exciting part of smashing that cake! Emery was not sure how to take the pressure of everyone standing around her watching intensely with the cameras to see how she would react. Let's just say at first, she was unsure and a little intimidated. 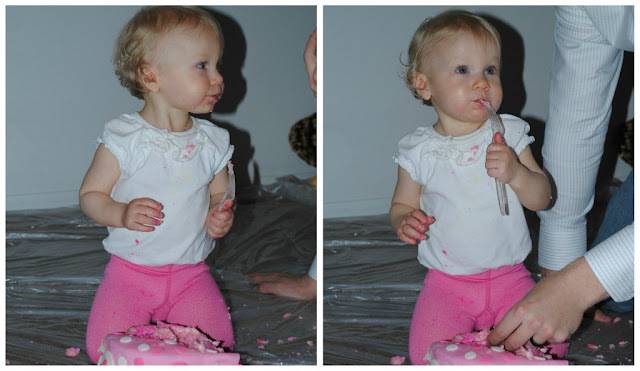 She slowly became more and more interested and would place her cute little pointer finger in the frosting, and would shy away for a moment, then build the courage once again to place that little finger in there! We thought to try some utensils. 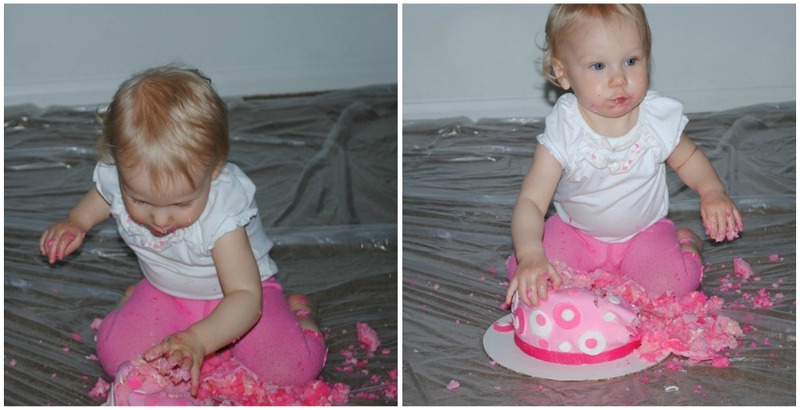 Maybe she didn't want to get all messy? With little interest on Emery's part, I decided to give her a taste so she would know just exactly how delicious this big beautiful cake was! We were sure she would then dig in. Haha! Nope! Not a chance. Daddy decided she needed extra encouragement to get things going. No way. She obviously did not agree. 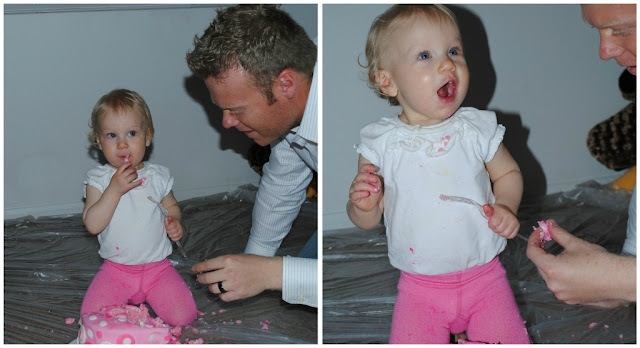 But with consistant effort, Daddy was sure to get her to try it! Alas! 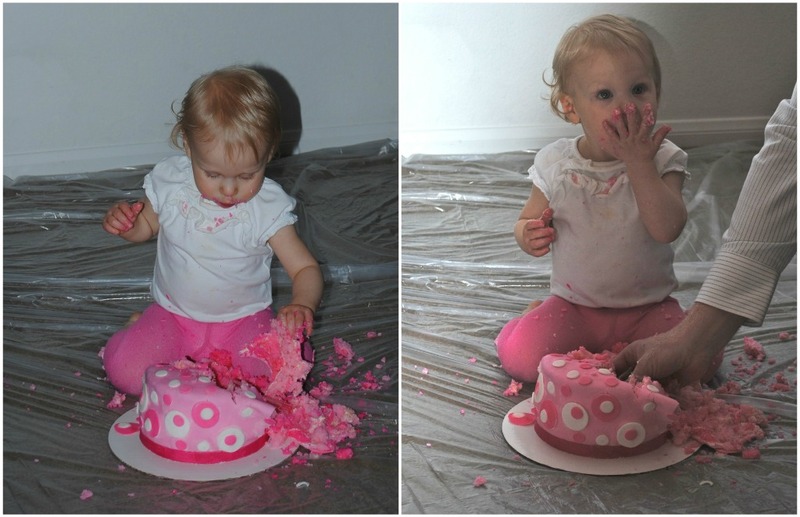 She caved in and tried that sweet frosting and realized, "I like it!"! So she agreed to try some more! Yes, those cheeks are just as fun to kiss as you would imagine them to be. 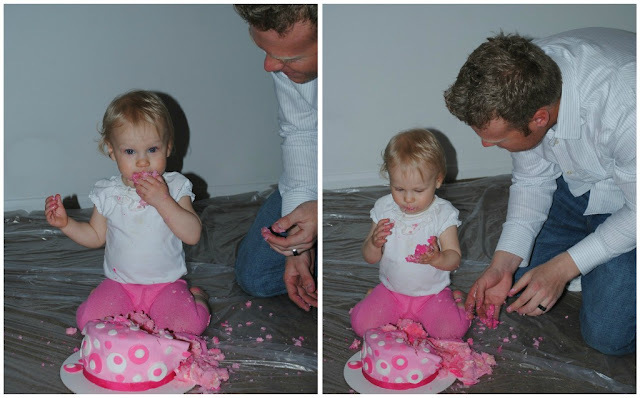 Even Daddy agreed that it was some pretty delicious cake! Pretty sure he ate more than Emery did. Emery liked it so much she began to realize it was all worth the mess. 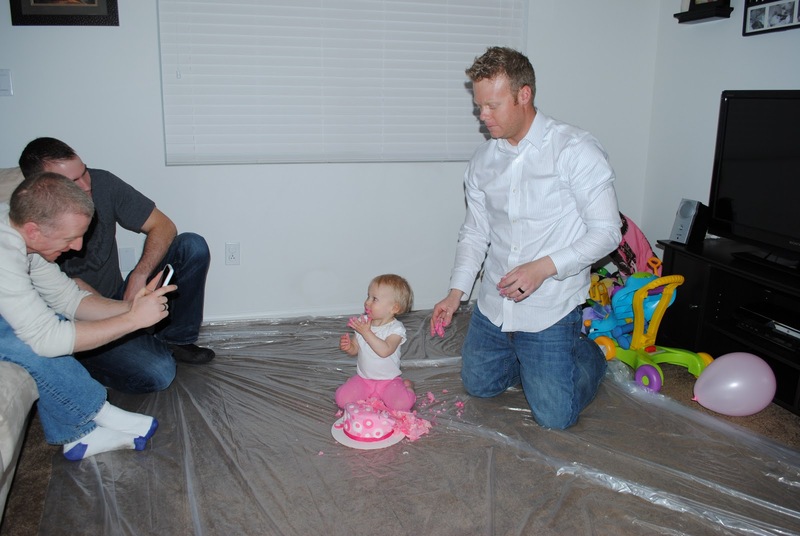 Haha, see Daddy's hand sneaking some more of that cake?! Emery is such a sweetheart, she even asked if anyone wanted to try some of her cake! That's my girl. We realized we should have opened the gifts before the cake smashing, but we decided it wasn't so bad. Mommy went upstairs to clean Emery up and Daddy cleaned up the mess (was sure to save the cake for later enjoyment) and set out the wonderfully thought-out gifts from those who love her. Once again, Emery was unsure of the situation. I mean, she had never really had her own birthday before. I would be a little worried too if the pressure was on me to entertain all of my friends without knowing what the heck was going on. Once she realized there were some pretty fun things hidden beneath all of that paper, she became a little more excited. This card that Melle got her has a Peek-A-Boo baby bear that really entertained her! 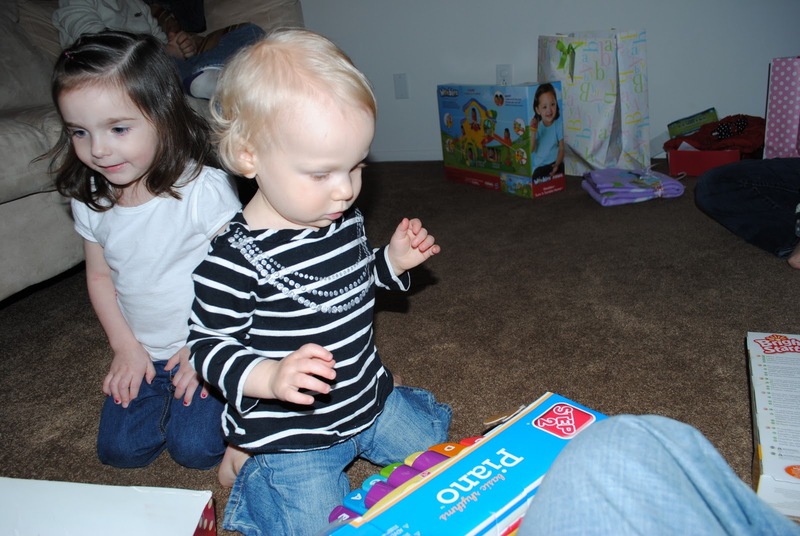 Molly was sure to help Emery open her gifts. She is a professional you know. She just turned 2 back in October and knew exactly what was going on. She was so helpful and loved seeing the new toys! Oma (Grandma in German. AKA T's Mom) sent some adorable new clothes for Emery to wear. We can't wait to dress her up! Emery loves putting things on her head, and was having a ball trying on her new headband from Oma. She also enjoyed the little piano set from Jen and started dancing to "Twinkle Twinkle Little Star". She was rocking out and Molly thought it would be fun to join in. Obviously, Emery wanted it all for herself and once she realized Molly was taking over, she knew she had to cut in. So she slowly walked knee-walked on over and cut in front of Molly. And got her little piano back. Thank you again for all who came, gave/sent a gift! We are also so grateful for all the loving and wonderful people who have made this past year a wonderful success and given us so many beautiful memories. Emery is so lucky to have such people in her lives.